Annie earned her BS & MS from the University of Oklahoma and her Ph.D. in Higher Education at the University of Northern Colorado where she was honored with the Distinguished Alumnae Award. She also studied painting and art history in the BFA program at Oregon State University. She achieved the rank of Associate Professor in her successful academic career at several colleges and universities prior to pursuing her passion for art full-time. 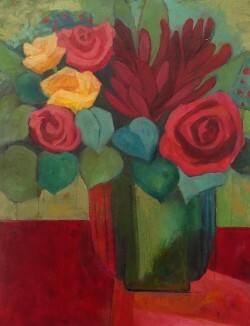 For the last nine years she has been a professional artist, painting out of her studio on Canyon Road in Santa Fe, NM. She is represented by several galleries across the country and recently was honored with a museum acquisition of her work. She utilizes her academic expertise to teach innovative painting workshops at the Georgia O’Keeffe Museum in Santa Fe, NM, Ghost Ranch, Abiquiu, NM and venues across the country. 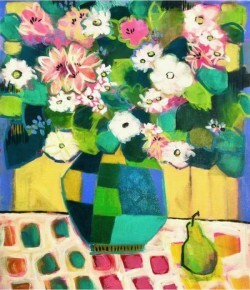 Her paintings appear in numerous shows and are in private and museum collections. 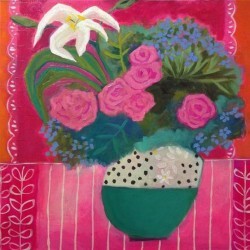 She is working on her second book; her first book, "Bold Expressive Painting" is available.